In the first part of this series. I'll be showing you how I started off my journey making Hoshigaki Persimmons. Hoshi means dried and gaki is from kaki, the Japanese word for persimmon. They're persimmons that are dried the long way. No involvement of a dehydrator which will make them just dry and tough. 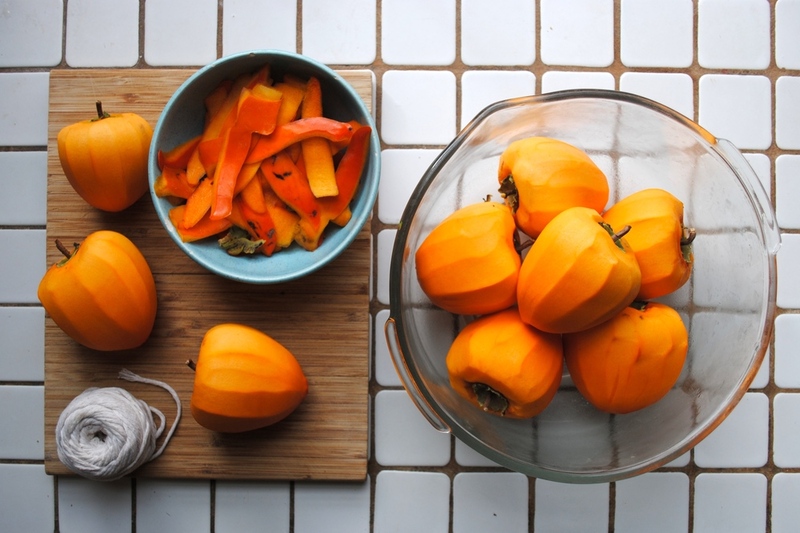 The hoshigaki method involves using the hachiya variety (acorn-shaped) of persimmons dried the traditional Japanese way—in the sun or if you live in a foggy city like San Francisco, in your home. The persimmons are also gently massaged by hand once every few days to break up the inside pulp, smooth the outside and to encourage the fruit's sugars to migrate to the surface in a "delicate white bloom." In the end they're supposed to end up looking like a softer dried fruit that's frosted in powdered sugar. The taste intense. With concentrated persimmon flavor, honeyed overtones and perhaps the barest hint of cinnamon. However, It's definitely the texture that gets even more interesting. Hoshigaki are supposed to be chewy and have almost jelly-like insides. Tender and succulent. The whole process takes several weeks. Starting now is perfect if you want to have them ready for the holidays. I bought 9 persimmons at my Sunday farmers market. I made sure they had enough stem left on the fruit so I could tie them up and hang them by that stem. Some recipes call for a perfect t-shape stem but I didn't find this necessary. Next, I peeled off all the skin. Leaving no trace of it. Also, some recipes call for sanitizing your fruit in a neutral flavored liquor like vodka. I didn't do this. I might for my next batch in Part 2. Next I gathered up some kitchen twine for hanging the fruit. I found in my pantry and made sure to cut the string in equal lengths. The equal lengths in the string will allow me to easily separate my batches by length of string in the future. Tie up the persimmons tight and find a place you want to hang them. Some good spots are outside in direct sun, inside in front of a sun facing window, or another cool dry room. For this batch I started them outside but eventually moved them inside by kitchen window. The fog was just too heavy and left the persimmons wet after the first night out on their own. Once you hang them they look like cute little lanterns. That doesn't last long though. I'm about a week into the process now and they've lost all that cuteness. They're starting to dry out and darken. I've also massaged them twice since hanging. Look out for Part 2 where i'll start a second batch and post photographs of the process for Batch 1.